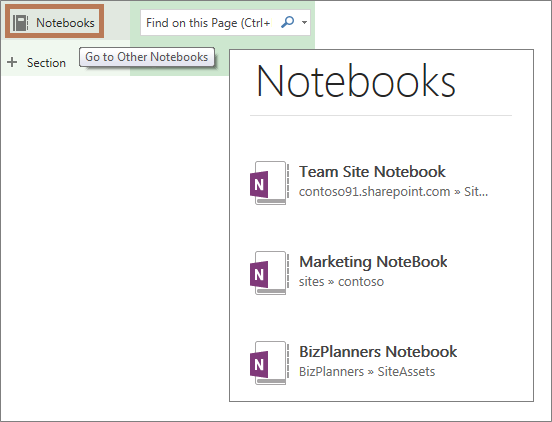 When a team site is created, a shared OneNote notebook is automatically created as part of the site. You can use this notebook to capture, compile, and share minutes, thoughts, and ideas with your teammates. In Quick Launch (the navigation links on the side or top of the page), click Notebook. Tip: If for some reason the link is removed, you can locate the notebook in the Site Assets library (In the Quick Launch, click Site Contents, and the click Site Assets). 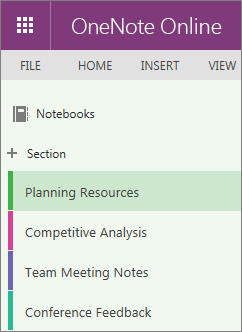 Alternatively, to open your team site notebook from OneNote, near the top of the page, click the name of your current notebook, and then locate the team site notebook from the list. Tip: Use the OneNote page templates feature to guide you in designing pages. For more information, see Create or customize a page template in OneNote. A good way to promote team collaboration is to leverage a team site's built-in OneNote notebook. The whole staff can use it as our place to keep meeting notes, team processes, and even quick thoughts and ideas. In Quick Launch, I click Notebook. By default, this opens the notebook in OneNote Online. If I wanted to open it in my desktop version of OneNote, I’d click here. But I’ll just get started in OneNote Online. I'll create some new sections, and anyone with permissions can add, edit or view pages. The notebook is automatically available to the team. To find it in OneNote online, I click on Notebook. And here it is, along with all my other notebooks. In the desktop version of OneNote, I can get the same list of notebooks by clicking the name of the Notebook I'm currently viewing.